Which Brand Would You Choose When You Buy PC/Laptop? Does It Matter? You are here: Home / Blogging / Which Brand Would You Choose When You Buy PC/Laptop? Does It Matter? I’ve been using the same Acer laptop for the last 4 years now and it’s still working fine till these days. I still remember back then there were naysayers referring to Acer as a cheap-made-on-asia and thus an unreliable brand. 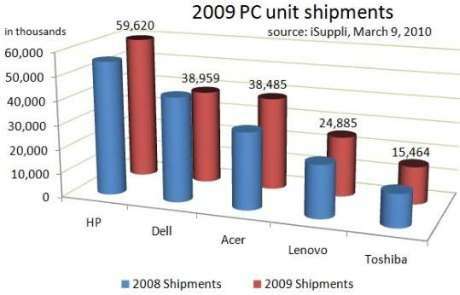 Well, the sales numbers certainly don’t reflect that, with Acer at the #3 spot for units shipped worldwide in 2009. The top 5 are HP, Dell, Acer, Lenovo and Toshiba. Given that the specs, software, hardware, price are the same, which brand would you trust most when it comes to buying a new pc/laptop/netbook? ..i jus want to ask a question.I have account in my.opera.com,and theres a blog there. i add that on my account. is there a possibility that i can link that on adsens.. .what will be the website url am i going to put on adsens when i want to signup…thanks..